With the increase in the number of workloads in the datacenter be it virtual, physical or cloud, the infrastructure needs to enable a varying mix of LAN and SAN traffic. Cisco Unified Fabric, Cisco’s Data Center Switching solution, delivers flexibility with multi-protocol support. It enables true convergence by combining the power of Ethernet and Fibre Channel (FC) technology. 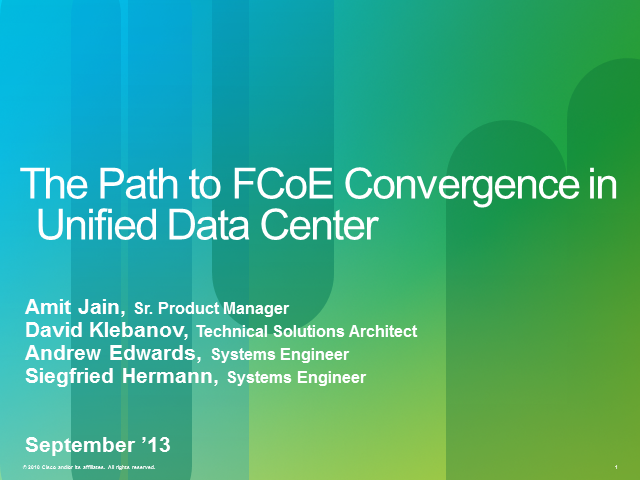 This session will help you understand how FCoE technology can be deployed incrementally in the evolving converged Data Center designs. Some case studies from customers like Boeing will be presented to demonstrate the real-world view and benefits of FCoE designs. Big data has become mainstream as businesses realize its benefits, including improved operation efficiency, better customer experience, and more accurate predictions. However, companies are often challenged by the complexities of traditional server solutions. In this webinar, you will learn how to unlock the value of big data with the Cisco Unified Computing System™ (Cisco UCS®). Nearly all industries are deriving value from big data and Cisco UCS delivers the performance, capacity, management simplicity and scale that businesses need to increase agility, speed time-to-value, and deliver a competitive advantage that drives revenue. Sean McKeown, (Cisco) Technology Solutions Architect, explains the range of solutions and activities designed by Cisco for the Big Data market. Cisco's Andrew Levin and NexusIS's Paul Sferratore address the organizational and operational challenges in the new data center model and unified fabric. Will unified roles or unified tools move the business forward? Watch and see.